Following the Georgia Conference, I returned to Atlanta Thursday evening and caught an early flight to Baltimore, Maryland for their state conference, Maureen Tipton, State Regent. Arriving in time to briefly see the exhibit room, I enjoyed the display of their WW I Commemorative event. As much as I regretted being unable to greet the Maryland Daughters following the banquet, I appreciated an early evening in order to plan for another flight the next morning. 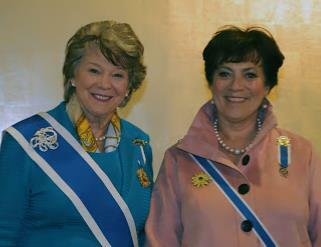 The 114th Maryland DAR State Conference was called to order on Thursday, March 21. 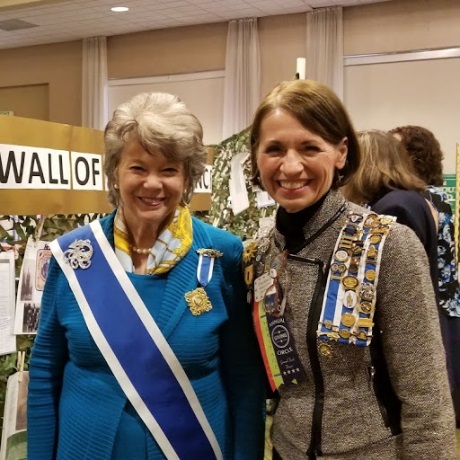 Following the opening ceremonies, Daughters from across “The Old Line State” were welcomed to the Conference by Nancy Smith, Regent of the Colonel John Streett Chapter, my home Chapter. It is during the opening session that Maryland Daughters pause to honor and remember the women who have passed away in the past year. Fifty Maryland Daughters were remembered at the Memorial Service led by State Chaplain, Sherry Georg. Two of the daughters included an Honorary State Regent and Past State Officer. Their leadership and commitment to the Maryland Society is one to be admired and emulated for many years to come. Opening Night made its debut on the Big Screen at the Flickering Treasurers Banquet. The evening opened with entertainment by the Revolutionary Warblers featuring New York Daughters, Elysia Segal and Gyda Saubaugh. Their performance included historical tidbits about the musical selections all of which were chosen from movies from the early days of the theater up until today. The Maryland Daughters thoroughly enjoyed the Warblers’ performance, and singing along, too! Two of the weekend’s Special Guests included Delaware State Regent, Susan Meade-Beachell and Pennsylvania State Regent, Cyndy Sweeney, both of whom brought warm greetings to the Maryland Daughters at the banquet. The Opening Night guest speaker was Amy Davis, who took us on a journey to rediscover forgotten Flickering Treasures of a bygone century of cinema in Baltimore through a sweeping retrospective of its movie theaters. Mrs. Davis is a Photojournalist who has garnered many national awards since joining the staff of The Baltimore Sun in 1987. Her photographs have been exhibited at many museums, area galleries, her work is in the collection of the Hudson River Museum in Yonkers, New York, and in private collections. 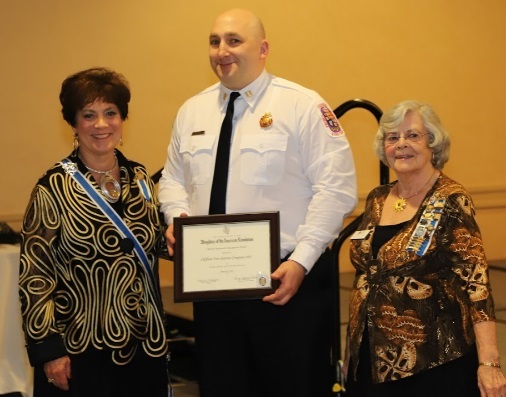 Also honored at the banquet was the Historic Preservation recipient, Captain Danon Ushniski from the Chillum Fire/EMS Dept 844 and their work on preserving the Boundary Stone NE3 Restoration effort. New Members and New Horizon Graduates, Junior Membership Awards, the Presentation of Pages, and the State Outstanding Junior, Abigail Klein, were honored. Our luncheon on Friday, Nursing Our Veterans, honored the men and women who care for veterans staying in a VA Facility. This was also our first opportunity to greet the President General and welcome her to Maryland. The State Regent presented each of the four honorees with a certificate, a State Regent’s Challenge Coin, and a donation. Later in the afternoon, Maryland Daughters who are members of the Heritage Club were treated to a reception with Mrs. Dillon. Each Daughter in attendance had a few moments to visit individually with Mrs. Dillon and then she shared a bit about the status and progress of the NSDAR Headquarters. Mrs. Dillon was kind enough to answer some questions, everyone left with a renewed commitment to our beloved NSDAR Headquarters. The Evening Banquet opened with a performance by the Air Force Strings Quartet which set the stage for Mrs. Dillon, our keynote speaker. It was also a pleasure to have the Vice President General of the Mid-Atlantic States District NSSAR, Lou Raborg, and James Adkins, the SAR Maryland State President and HODAR of the State Librarian as our guests for the evening. Both Lou and Jim brought greetings to the Maryland DAR and spoke of the important work the two organizations do individually and collaboratively. The President General’s keynote address was both timely and encouraging. She spoke of the importance of commitment to God, Home, and Country, the National Society, and future generations. Following Mrs. Dillon’s address, the Maryland Daughters presented to her a United States Flag that was flown over Fort McHenry, the birthplace of the National Anthem, to commemorate the celebration of her birthday and a sterling silver charm highlighting Frances Scott Key and the American Flag. The Tipton Administration, the State Chairmen’s and the Junior’s Club each presented a check for the President General’s Project. Then, the Maryland Daughters bid adieu to the President General who was off and away to the Florida State Conference. Saturday morning began with greetings and a report from the Maryland C.A.R. State President, Daniel Klein. Maryland DAR has long enjoyed a close relationship with Maryland C.A.R. and annually the Daughters look forward to supporting and hearing of the accomplishments of Maryland C.A.R. The morning continued with reports from Chapter Regents and State Chairmen. The Saturday Afternoon Awards Luncheon opened with the presentation of the colors by the Maryland SAR Color Guard and was followed by a performance by the Frederick Town Fife and Drum Corp. which is sponsored by the Sgt. Lawrence Everhart Chapter, SAR. This performance has become a “fan favorite” of the Maryland Daughters. 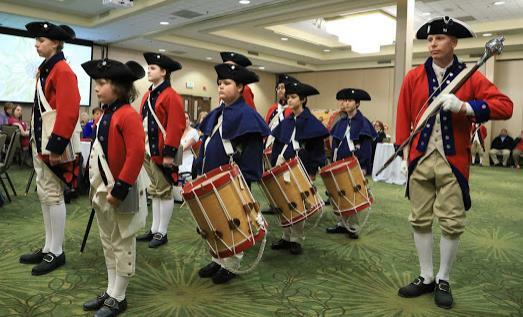 Among our most rewarding activities is working with schools on contests sponsored by DAR, and tribute is given by our Maryland Society to the winners of contests that preserve history, promote education, and foster patriotism. All of the winners have distinguished accomplishments and Maryland Daughters are always pleased that the recipients, their families, and friends share in the Awards Luncheon. Presentations were made to the winners of the American History Essay Contests, the DAR Good Citizen Awards, Community Service Awards, Outstanding Teachers of American History, Maryland DAR Scholarships, and the Linda C. Mistler C.A.R. Scholarship. All photos are provided by Mike Donahue, the Maryland State Registrar’s HODAR.